There’s a weird dichotomy in this whole book between what the characters are actually doing and what they (and Rand) describe them as doing. The level of hypocrisy is pretty much on par between the good guys and the bad guys, it’s just that Ayn Rand castigates the bad guys for their hypocrisy while joining the good guys in theirs. The good guys are also happier with their hypocrisy, which makes me happy. While I sure would appreciate a few sincere people, I definitely prefer happy hypocrites to unhappy hypocrites. This, I can agree with whole-heartedly. Be successful, not by dragging other people down but by building yourself up. Yes! Anyway, the summary is going to be vague because it’s less a series of events and more a lot of description and philosophy. After that, I’ll have a few comments and a small rant. The whole chapter consists of Dagny spending a month in “Galt’s Gulch” AKA “Atlantis,” meeting people and learning the way of life in this utopia. Dagny discovers that the outside world thinks she’s dead, that she’s not allowed to send a message to anyone letting them know it’s not true, and that she can’t leave the valley for a month. Dagny decides that for the duration of the month, she will be paid for doing some make-work for Galt, and he agrees. Ragnar explains that he is stealing gold and taking it to Mulligan’s bank and depositing it in the name of various industrialists, Dagny included. It is her money when she wants it. She refuses to use it, but everyone else treats her as an heiress with money. Francisco arrives, is delighted that Dagny is alive, and declares that he loves her and everything he has done has been for her sake. Meanwhile, John Galt has been stalking Dagny for years. John Galt wants Dagny for himself but first wants her to reject Francisco, fair and square. There’s a weird dynamic in which Francisco thinks he’s lost Dagny to Rearden, Galt and Dagny both know that Galt is the competitor, but no one is going to tell Francisco that. We learn that Galt lectures people on physics, but only those people who will be able to make direct use of it, and not Dagny, because she’ll use it in a way he doesn’t want. Dr. Akston talks about his three students: Francisco, Galt, and Ragnar in college. They were all brilliant. Akston and Stadler gave them special privileges and training because they were worth it. And Stadler is a dirty traitor. Hank Rearden is still searching for Dagny. Dagny decides that she has to go back out into the world and at least try to save the railroad, certain that when the public’s lives are at stake, they’ll finally listen to her and see reason. Galt declares that he will continue to stalk her in order to whisk her back to the valley as soon as she gives up. Francisco finally buys a clue and realizes that Galt and Dagny are destined for each other. He shows this by giving them his heirloom silver goblets, which they accept as their due. They are certain the rest of the world will collapse without them and they will make certain it happens by working just as hard as they possibly can to tear down the rest of the world. Dagny is going out to try to save her railroad. Galt and Francisco specifically say that they don’t think she’ll succeed and that they will be actively working against her to make sure she fails. The world isn’t so much collapsing because these geniuses have gone on strike as that these geniuses have formed a terrorist organization to cause the collapse. 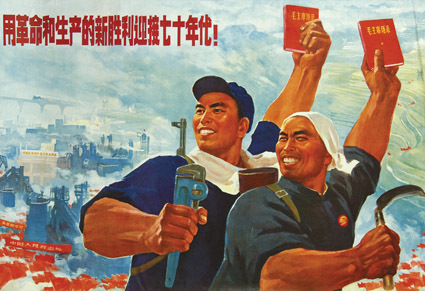 While the verbal descriptions say this community is based on capitalist ideals, the actions and interactions being shown actually illustrate a communist utopia. Here are a bunch of people who have given up everything they had in the outside world in order to work hard in a setting where they are supporting other hard workers. Each individual works hard, trades value for value, and gains pleasure from working together and supporting a hard-working community together. Money is, at most, a token representation of value transferred. They are working for the greater glory of god/Galt/industry/whatever-ideal-they-want. Unlike modern versions of greed in business, there is no planned obsolescence, nor even any cost-benefit analysis. What is best is best and there’s no acknowledgement of diminishing returns. They want to work and they want to create great things. The oath, which I thought was so ludicrous in chapter 1 of this section, turns out to not be an issue. It is routinely ignored by everyone. The presence of both marriage and children demonstrate this. Plus, people are constantly giving gifts to each other and calling it fine, because they are getting enjoyment from giving the gift. John Galt is paying Dagny for some make-work, and relying on Ragnar’s deposits of money in the bank for repairs to her plane, even though she denies that she’ll ever use it. Nobody is taking that oath seriously. Rand’s version of the world reminds me of Newtonian physics. It’s very straight forwards, and (relatively) easy to comprehend. It’s a good working theory of the world. It’s not correct, but the errors are trivial for any daily use. In physics, it’s only when you get to very small things and very big things, that you need Einsteinian or quantum physics, to show that the observer matters and interactions are more complex than they might first appear. In the world of Atlas Shrugged, values are absolute. If reasonable people disagree, it’s only because one of them is working with false data. Personal preferences and individual values do not exist. A single object has a set value, and no reasonable person will value it more or less than anyone else. A dinner is a dinner and has a set value, regardless of whether the person eating it is starving or already full. A wrench is a wrench and has a set value, regardless of whether the person owning it is a mechanic or a singer. I believe that Rand needs to reassess her premises. People really and truly do value things differently. I dislike people whining about how hard-done they are and I really dislike it when people bad-mouth someone else to me. As much as the bad-guy, stupid liberals in this book do it, the hard-working, good guys do it just as much. It just makes me uncomfortable and makes me think less of the whiner. Thus, Akston whining about Stadler effects my opinion of Akston a lot more than it does my opinion of Stadler. I had an experience in which I was training under two different martial arts instructors who had had a falling out with each other. In the particular circumstances, I agreed with one of them over the other, but I didn’t have the position (or desire) to voice an opinion. They simply trained at different schools after that and I continued to train with both. But even though they now had no interactions, they each continued to take the occasional verbal potshot at each other to me. They were both excellent teachers and excellent martial artists and mostly I just wished they would stick to their teaching rather than try to convince me that the other one wasn’t as good a teacher as they were. Plus, Halley complaining that the audience in the outside world didn’t appreciate his music in the way he wanted it to be appreciated made me think he wasn’t as good an artist as he was described as being. Here’s a hint: if you are trying to communicate something and the person you’re talking to isn’t getting it, then you’re probably not communicating it well-enough. This entry was posted in Fiction and tagged Atlas Shrugged, Ayn Rand. Hah! She really did troll herself, didn’t she. All her propaganda might be capitalist, but the ideals and actions are all communist. I have this working theory that no matter how you try to distance yourself from the religion you were raised with, it still manages to bleed into how you think about things. Perhaps Rand got so drilled in Communist theory in her youth that it comes out unexpectedly, like in her vision of heaven. I feel like Ayn Rand is spinning in her grave at the idea that she’s quoted in the same discussion as Marianne Williamson (but I’m with you on which one I’d rather listen to). Heh. I think she’s spinning in her grave regarding a lot of things happening. Having her philosophy be compared to a religious, humanist philosophy would be one of them, but the corporate bailouts should have been enough to bring back zombie-Rand to yell at Congress. I swear, of all the things our Congress deserves right now, zombie-Rand is right up there at the top! What are you? Are you a zombie or a plant, whose only needs are physical? Or are you a human being who has a mind? Do you think that you can live as a human being without a mind? Do you think that your mind requires nothing for its optimal health? Do you think that your self-interest is restricted to sheer physical gratification? The food that you put in your mouth has to come from somewhere. Do you think that brain-dead physical motions will put food in your mouth? Try it. So how do you fuel your mind? How do you ensure that it has the energy and the motivation to continue producing the value equivalent of the food, shelter, clean drinking water, vaccines, antibiotics, and smoke detectors that keep you alive, and the luxuries like air travel that make your life more comfortable and enjoyable? Television, movies, books, music, paintings, spa trips, friends, lovers and children can all contribute to fuel your mind. These are all primarily psychological values. If you decide to marry someone, is it because you want someone to sacrifice your overall well-being to? You want to be a chronic martyr for his sake? If that’s why you want to get married, then you’re sick, evil, or both. A lover can be a tremendous psychological value (in addition to a physical value.) Loving a virtuous person is most profoundly in one’s self-interest. If you decide to have children, are you doing it for the sake of human beings who don’t even exist yet? Do you want them because you want someone to sacrifice your happiness to? Once you have them, do you get maximum joy from them by having them as your meek slaves for the rest of your life? Or are the real pleasures of parenthood realized by seeing your children grow, develop and live healthy lives of their own? Your children are your creations. You influence their choices, and your values will almost certainly show up in them. If you think that the pleasures involved in having children will outweigh the difficulties, stress and effort that you face in having them, then it’s in your self-interest to have children. If you don’t think this–if you think that having children will be an overall sacrifice–then you shouldn’t have them. Proper socializing or love is not living for the sake of others, but making contact with others for the sake of one’s own enjoyment of one’s own life. Rand’s heroes are neither sacrificing for each other, nor working for “the collective.” Each one is out to make his or her own life the most prosperous, enjoyable life it can be, over as long a time as possible–as a mental and physical being. That is what a person’s self-interest means. A person’s self-interest does not consist in working as a slave of those who are impervious to reason. It does not consist in letting oneself be bled dry by parasites, spiritually and materially. A real free market (unlike what we have now) encourages products that have a lifespan according to the reasonable desires of the customer. A free market doesn’t artificially hold up high quality labor/part costs with pro-union legislation, and doesn’t do a thousand other things that inhibit productive efficiency. It allows fluid and responsive competition among businesses, rather than collusion with the government to shut the market to competitors. If I as a consumer want to pay a larger sum for a product that lasts longer, then there is no bar to some business making a higher profit by offering it to me. If I want to pay less for something that will last a shorter time, perhaps because I’ll be upgrading before too long anyway, then that’s where the profit is. I may decide that those companies that have their product approved by a reputable, private product reviewer will get my business preferentially. So that’s the company that will profit from my business. Once you’re done with Atlas, I recommend The Virtue of Selfishness and Capitalism: The Unknown Ideal by Rand and Capitalist Solutions by Andrew Bernstein. This is my last long response on this blog. 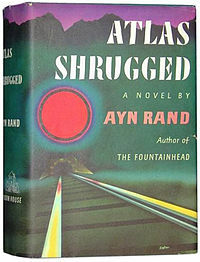 Enjoy the rest of Atlas Shrugged. So, I agree with a lot of your points here, particularly in the personal enrichment of building family and friendships in one’s life. Here’s where I break with the Rand philosophy, and LOTS of other people’s philosophies (I’ve had this debate over and over again with lots of different people and it always ends in a stale mate): I do not believe in “evil,” or even that people can simply lack reason and be parasitic in nature. I believe that people can get to desperate places in their lives that lead them to do desperate things that are destructive to themselves or others, but I don’t believe that a human being can simply exist without the capacity for reason. This is not an easy belief to hold because I admit that there are certainly some obvious and extreme examples that seem to prove otherwise, but this belief is as close as I get to a religion, and there is no argument that is going to change that. In light of this, Atlas Shrugged has been increasingly difficult for me to read because she does use the word “evil” far, far more than I’m comfortable with. I also see John Galt and his people willfully turning away from saving people’s lives, people who were on the road to agree with him, but just didn’t have the ability to think quite as broadly as he is able to. Anyway, while I can’t say that I’m actually enjoying the experience of reading Atlas Shrugged, I am finding it very worthwhile and I’m glad I’ve tackled it. I think that my lack of belief in inherent evil or even inherent lack-of-goodness means that it simply wasn’t possible for me to totally get on board with Rand’s philosophy. I am, however, already (grudgingly) noticing some differences in the way I think about my own work and even the general concept of work in our world, and it is not every book that can inspire that. It’s not that they don’t have the capacity for reason. It’s that they are unwilling to exercise their capacity. This is what makes it evil and not simply an inevitable fact of existence. You’re all kidding yosruelves. Jolie doesn’t give a f**k about the roles she plays (Tomb Raider! For f—ks sake!?). Her being signed is no indication about how good the plot, the directing, the editing and the writing are. And those are the areas where, on average Hollywood has been scoring poorly in recent decades.Look at the director and the writers and then tell me your predictions about the celluloid version of Atlas Shrugged! So, I am almost positive that the above is spam, since the Atlas Shrugged movie would have been so lucky to get Jolie, but it made me laugh, so I approved it. I have to admit that the rant is very similar to ones I have given in the past: that Jolie has been marketed to us as a much better actress than she is just because of her beauty. However, what is love? I think the process of loving someone is finding something of value to support that is outside of oneself. Thus, in a circular manner, it’s in one’s own self-interest to be selfless. This is not indiscriminant altruism that can’t distinguish one person from another, but it is a selfless giving of oneself to a worthy other, either a person or a goal. This is why I think that oath is so horribly wrong. It is important to be able to live for someone else and to allow others to live for you, denying that is to deny all community and all worth. Marriage is not a simple trade of virtue for virtue, but an agreement to jointly live a single life, to stop measuring trades, and instead to support each other, for better or for worse. Marriage is a situation where two people are literally agreeing to combine their lives, living for each other, not in slavery, but in one life and it should not be seen as wrong. Having a child is literally asking another human being to come into existence because you want it. I cannot think of another example that more perfectly illustrates asking someone to live for you. But it is not slavery and it is not wrong. Moving on, you say that a free market allows fluid and responsive competition among businesses, rather than collusion with the government to shut the market to competitors. I believe that we’re actually in agreement here, as well, about the importance of allowing free competition. The disagreement comes when we look at how that is managed. From my point of view, one of the government’s roles is to prevent one company from creating a monopoly or allowing a collusion between companies that shut the market to competitors. You as a consumer need to be allowed a choice between options so that you can support the preferable one, rather than being only offered one option or only fake options. This has come up recently in analyses of the medical market: When you need medical care, you are rarely in a position to comparison shop, and you are almost never in a position to just do without. Thus, hospitals and emergency care centers are free to name any price they want because you don’t have a choice. This is not a free market. Anyway, I am thinking of trying to track down a copy of The Virtue of Selfishness because I really would like to get a better sense of Rand’s thoughts, when they are not presented through the words and actions of fictional characters. Sorry to inundate you with such a long reply, but you should absolutely feel free to leave as many long replies of your own as you would like. So what you’re saying is that the two people coalesce and you can no longer distinguish the thoughts and actions of one from the other. One spouse cannot live after the other dies. One spouse’s crimes are equally the crimes of the other. Divorce is never appropriate under any circumstances, since divorce means spiritual death (then physical death) for both spouses. I’ll notify the justice system. People can’t change their fundamental nature as individuals by agreements with each other. I’ll notify the justice system. Um, the justice system is already well aware of this. You’re mixing up governmental or religious laws with natural laws. In natural laws, no, of course the individuals remain individuals. However, legally and religiously, yes, the basic structure of a marriage is that it defines one family entity. Because I am a modern humanist, I believe that there are always exceptions to any given fundamental theory. There are certainly situations in which divorce is the appropriate response. On the other hand, I think that if you are entering into a marriage with the intent that it last until the divorce, then you should probably just remain lovers rather than enter into a contract that is intended to be permanent, regardless of the existence of an emergency exit clause. The proper idea of a marriage is that the values of the two partners are so aligned with respect to the outside world that they no longer need to separate the material aspect of their lives. Their harmony of values means that they no longer need to measure material/financial trades between the two of them. They are both reasonable and, given their common basic values, can come to agreements about what to do financially. While we could get into a detailed discussion of what constitutes a good relationship, I think I would rather point out that being married is distinct from having a long-term lover. I wasn’t surprised that Ragnar and Kay were together in this utopia, I was surprised that the institute of marriage existed there. Hopefully, if you are married, you are married to a long-term lover with whom you share values, but marriage is an added layer that creates a legal fiction in which two are one, for better or for worse. If you don’t want to live with that legal fiction: don’t get married. There is nothing wrong with just staying lovers. If a theory is fundamental, there are no exceptions. By that definition, I wouldn’t believe in any fundamental theories, then. Thus, I’m going to stick to my definition that says that fundamental theories are working theories: you live by them unless you make a specific choice to make a specific exception. For instance, I do believe that people should act rationally, ie, act in accordance with reason or logic based on facts. However, I understand that the world is too complex for any individual to ever have all the facts, and thus there are occasions when you need to act blindly, based on faith or desire or pure bloody-mindedness, instead. Sometimes you need to act, but there’s no way to know the correct action. Sometimes you have to take a chance. Start a new company even if there’s a 75% chance of failure. Ask someone out, even if you think they are out of your league. Go climb the mountain just to see what is on the other side because there’s a good chance it’s worthless but it might be something interesting. If Dagny had been acting rationally, she never would have flown her plane after Galt or crashed into the valley, and yet her irrational act paid off. If people had acted rationally, they never would have tried to ride wild horses before they knew they could be tamed, or sailed ships out into the ocean before they knew the world was round, or tried to fly before they knew that flight was possible. Some of the greatest milestones in human development came from people acting irrationally based on the facts they had, and discovering new things in the world that they could not have known if they hadn’t just tried. It’s not a good way to make all your decisions, but it’s a vital way to make some of them. Rationality means using the knowledge that one does have in taking action, rather than ignoring it. It means using reasoning based on known facts to inform one’s decision as much as possible. Those facts should include the fact that omniscience is impossible, human reasoning is fallible, and a perfect prediction of every detail of the future cannot be made. Another fact that one has to consider is that some situations offer only a very limited time to think before making a decision. A rational action in such a situation requires taking into account the fact that time is very limited. Life, in every waking moment as a human being, always requires taking facts into account. Thus, rationality is always a virtue. It is the fundamental virtue. Okay. As long as your definition of rational includes the acceptance of uncertainty and the ability to selectively decide to test ones premises (as Akston would say) by ignoring certain “facts” to see if they are true, then I agree with you. I also propose that kindness is a fundamental virtue, with the understanding that just like rationality is not limited to decisions based only on known facts, kindness is not limited to immediate results. For instance, letting a child gorge himself to sickness on candy or skip school because he doesn’t like learning is not a kindness. Nor was allowing Jim Taggert to reach adulthood without an understanding of cause and effect a kindness. Forcing your kid to learn while still offering a safety net that allows him to experiment is a kindness. As was Dagny offering assistance to Cheryl a kindness (even if Cheryl refused to accept it). It is a kindness to help people improve themselves and refrain from needlessly standing in their way. Such kindness is vital to a working society and thus a fundamental virtue of life.